Maypop is now serving coffee with a side of flowers in Webster Groves. 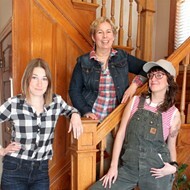 When Tammy Behm, Laura Caldie and Laura Tetley first came up with the idea for their combination garden center and cafe, Maypop Coffee & Garden Shop (803 Marshall Avenue, Webster Groves; 314-764-2140), they had a feeling they were onto something. Now, about a month into their operation, the response they've received from the community has confirmed those thoughts. "People in the neighborhood have been coming by to see us," Tetley says. "We're already getting some regulars, which is fun." A first-of-its-kind concept in St. Louis, Maypop is modeled after the hybrid cafe-and-garden shops Behm heard about when she was attending an international garden conference in Paris last year. 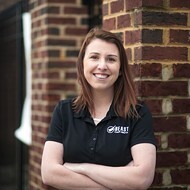 The idea clicked with her, and when she returned home, she reached out to her former garden center colleagues, Caldie and Tetley, to help her make the vision a reality. To bring Maypop to life, the partners transformed a nineteenth-century historic house and triple lot in the middle of a quaint Webster Groves neighborhood into a gardening oasis and cozy coffee shop. The outside work involved removing a few trees, grading and paving part of the land, building a large greenhouse and transforming the grounds into a lush, parklike oasis. Gardening aficionados of all levels are encouraged to walk the grounds and ask questions, which the knowledgeable attendants will almost certainly be able to answer — even something as seemingly impossible as how to grow a lemon or pineapple tree in the Midwest. Yes, they have those for sale, in addition for just about anything else your green thumb could ever desire. The coffeeshop part of Maypop is located inside the property's historic brick house. As Tetley explains, the partners undertook some fairly extensive renovations, but they always did so with an eye to the building's inherent character. "We widened the walls and put in a commercial kitchen and ADA bathrooms," Tetley explains. "However, we really wanted to maintain the architectural integrity of the house." That integrity is evident in the cozy cafe space that makes up Maypop's food and beverage operation. The seating space is made up of two rooms: one with a communal table and two handsome leather chairs that flank a vintage fireplace mantle, and the other with one large table and chairs. Though Maypop has its own commercial kitchen, the business partners decided that, at least for now, they would outsource the food side of the operation to other area businesses. 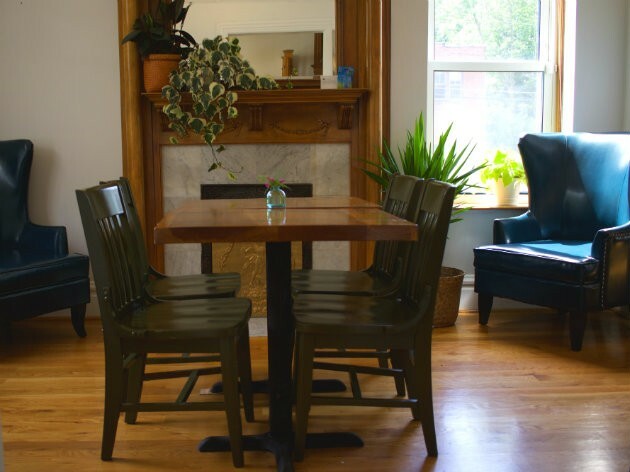 The Living Room provides Maypop with an assortment of baked goods, as well as grab-and-go items like salads, yogurt and picnic packs filled with either meat and cheeses or hummus and veggies. 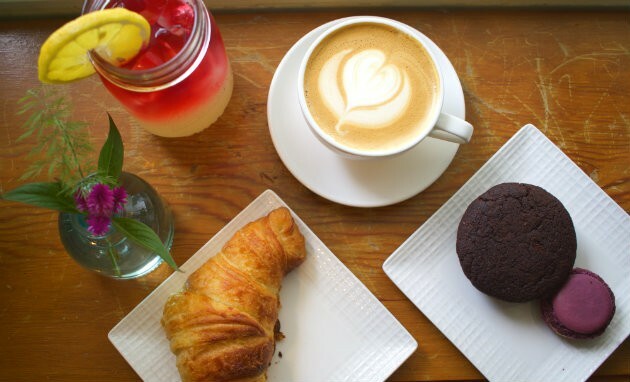 On the weekends, the cafe increases its bakery offerings with pastries from the French patisserie Like Home, including macarons and croissants. 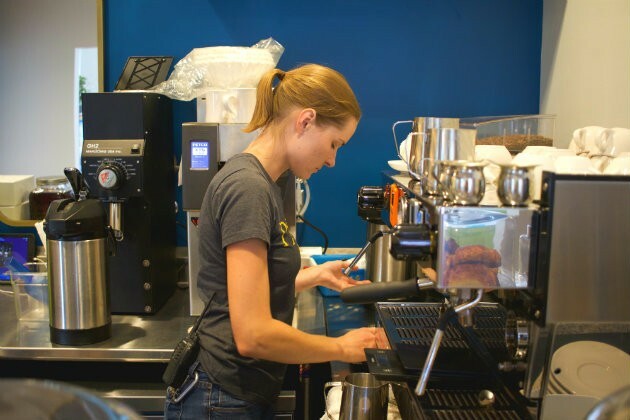 Laura Tetley prepares an espresso drink in Maypop's cafe. Tetley, who worked in the coffee business at both Kaldi's and Half & Half, is outfit's resident coffee expert (in addition to her barista, Cher, who she insists gets a nod for her efforts). Maypop gets its coffee from Blueprint Coffee and its teas from Big Heart Tea Co. In addition to coffee and tea offerings, the cafe serves housemade drinks such as hibiscus-infused lemonade. Behm, Caldie and Tetley have big plans for Maypop, including workshops, classes and community events, which will be added as they get their feet underneath them. They launched their first class, one dedicated to making succulent bowls, last week. Upcoming course offerings include "Sauce Bosses," a class dedicated to growing the herbs used in making pizza and pasta sauces, and a cocktail-themed garden-and-porch party in collaboration with the Missouri Botanical Garden. Maypop is host to the porch part of the event, where participants will learn about all of the different plants that can be used in cocktails. Maypop's cafe is currently open daily from 7 a.m. to 5 p.m. 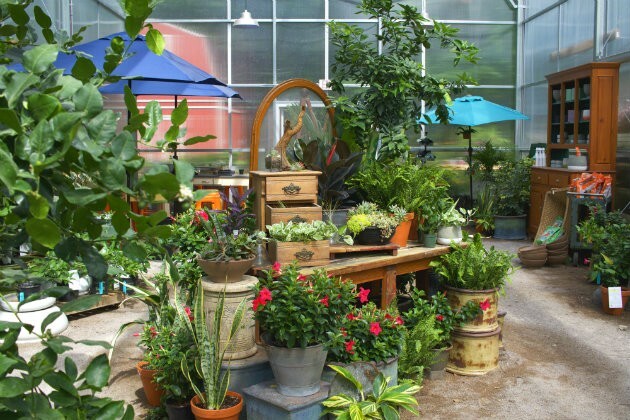 The garden center is open from 9 a.m. to 5 p.m. Sunday through Thursday and 9 a.m. to 6 p.m. on Fridays and Saturdays. Additional hours and special events are posted on its website and Facebook page. Click through for more photos of Maypop. 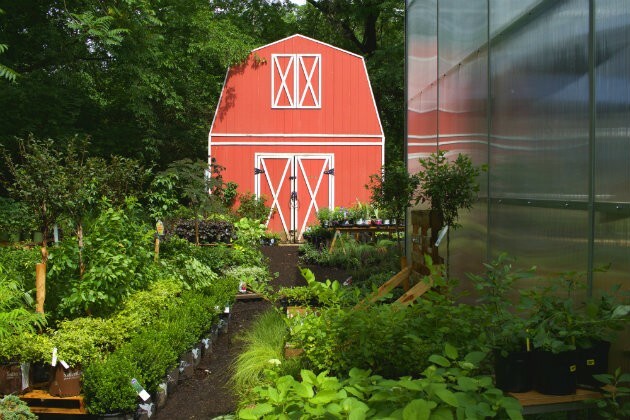 An old barn looks over the outdoor garden center. 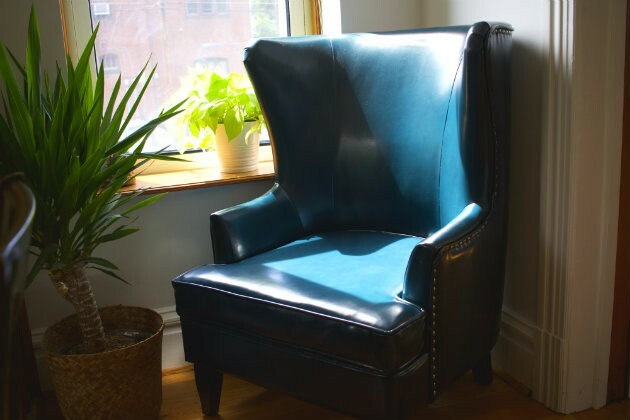 Guests are welcome to tuck into a cozy chair with a cup of Blueprint coffee. 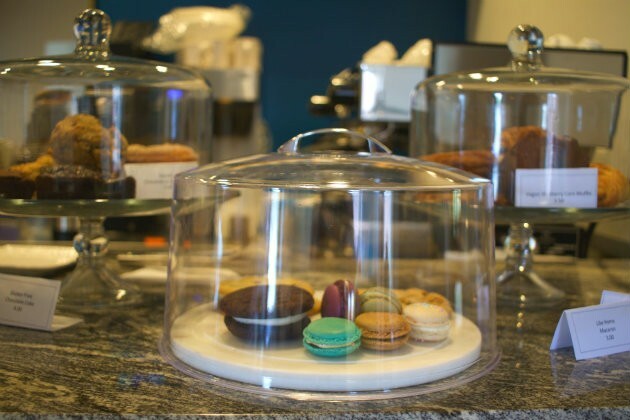 Maypop serves macarons and other pastries from Like Home on the weekends. A seating area inside Maypop's cafe. 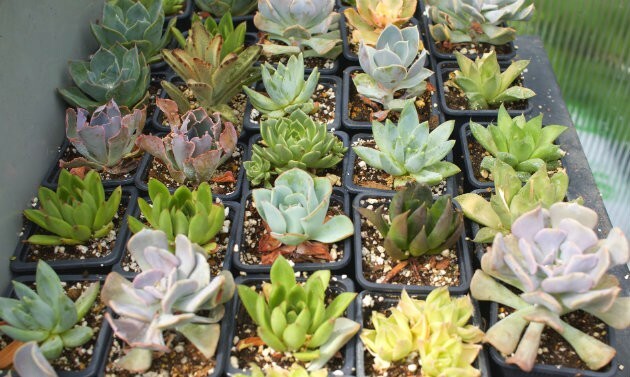 A variety of succulents are available.